IMPORTANT: These instructions are meant for use on your personal computer—DO NOT install Office 365 on your College‑issued computer. Your College‑issued computer already has Office software installed on it. If you install two versions of Office on the same College‑issued computer, neither version will function properly. If this happens, please submit a Case Log for technical support. NOTE: If your family needs access to Office programs, refer to the instructions on the Microsoft Office for personal use webpage, under the Staff heading, in the Microsoft Home Use Program section. Log on to HUB on your personal computer. On your HUB home page, in the Launchpad widget, under Applications, click Office 365. Enter your College user name (followed by @rrc.ca for staff or @academic.rrc.ca for students), enter your password, and then click Sign in. When the Stay signed in menu opens, select the Don’t show this again check box, and then click No. 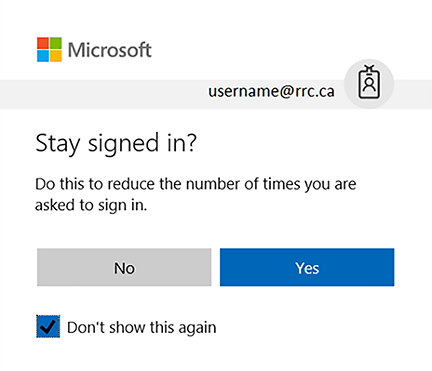 NOTE: ITS recommends that you select No to ensure that your account remains secure by requiring you to sign in whenever you use Office 365, even on your personal computer. Click Get Office apps, and then follow the prompts to install Office 365 on your device. NOTE: For some Apple devices, click Install software, and then follow the prompts. To sign out of Office 365, click on your user name in the top right‑hand corner, and then click Sign out. NOTE: To install Office 365 on your mobile device, follow the instructions located at Install Office 365 on a mobile device.